A bad deal is better than no deal after all. Who could have guessed? It has taken Mrs May and her colleagues 33 months to arrive at a conclusion so obvious that the crash-out possibility made its debut only after the 2016 vote, as a threat to frighten the EU-27. Its abandonment was marked appropriately when the Brexit secretary Stephen Barclay voted against the government motion which he had commended to the House of Commons a few hours earlier. And kept his job. Mrs May intends to submit the draft agreement a third time this Tuesday and will then seek a short time extension from the EU to avoid exit on March 29, since preparatory legislation has been neglected. Whatever the outcome, the humiliation of the United Kingdom has been most thoroughly accomplished by this hapless generation of elected officials. There could even be another midnight dash to meet Mr Juncker, from whom yet another meaningless elaboration on the draft agreement could be extracted. More pertinently, meetings are under way with the Democratic Unionist Party, whose 10 MPs were part of the 149-vote shortfall for the deal’s second defeat last Tuesday. If they can be converted, others from the Tory right would possibly follow. Mrs May bunged the DUP £1bn for extra spending in Northern Ireland to secure the support which keeps her minority government in office, a deal which runs out next June. The attendance of Philip Hammond, who holds the Treasury purse-strings, at the initial meeting with the DUP prompted journalists to pop the question to the DUP’s Nigel Dodds. ”No, we are not discussing more cash,” said an affronted Dodds, on behalf of the UK’s only coin-operated political party. 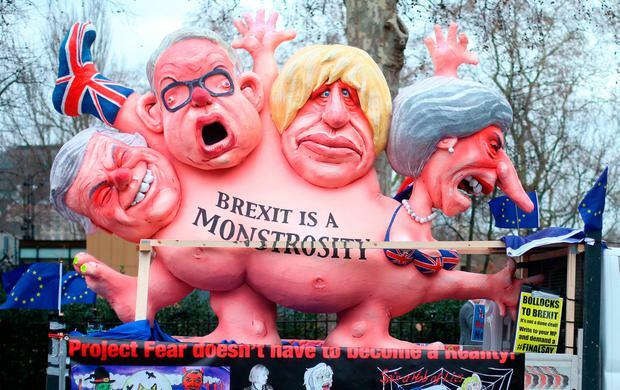 The majority on Thursday evening to seek an extension to the Article 50 period, the twilight of the UK’s 45-year membership in the European Union, was a fitting coda to this doomed exercise in ”taking back control”. Having chosen to convert friends into strangers, the UK relies on their kindness to facilitate the continuation of a Brexit process acknowledged to damage both. The ”discriminatory EU policies” to which the then Home Secretary referred are inescapable. The EU is a deep internal market, extending unimpeded trade access only to its members. There is no form of Brexit which retains the full economic benefits of membership. Mrs May’s conversion to the Leave cause since her appointment as prime minister does not alter these blunt realities. Brexit may deliver extra sovereignty, lower EU immigration and greater autonomy, but in the economic sphere, it is about damage-limitation. If the UK takes a hit, this will hurt the exporters of the Republic, for whom it is an important, if declining, market. There is double-trouble for Northern Ireland, for which the British market is more critical, but is also the source of substantial annual financial transfers. If a post-Brexit economic slowdown in the UK brings budget stringency in its wake, Northern Ireland will not be spared the consequences. There will be retribution for DUP bungs: Northern Ireland is not the only needy UK region. The deal envisaged in the withdrawal agreement contains the bonus, for Northern Ireland, of better long-term access to EU markets than will be offered to the rest of the UK. For Great Britain, the current arrangements, inside the EU, cannot really be bettered from a narrowly economic standpoint, unless you believe the fairytales about the El Dorado in distant lands that awaits Britannia Unbound. Mrs May did not believe them in April 2016 and can hardly believe them now. The 1998 Good Friday Agreement has ended almost all political violence but has not resulted in the sharp economic recovery in Northern Ireland for which hopes were high. There are notable bright spots, particularly the recovery in the tourism and hospitality sector but the overall outcome has been disappointing. Northern Ireland remains one of the under-performing regions of the UK economy. Whatever damage is inflicted by the eventual Brexit settlement will be borne by an economy that is hardly thriving. The same could, of course, be true in the Republic – the recovery from the banking bust has been impressive but there are grounds for fearing that it has run its course, Brexit or no Brexit. Both public sector and household balance sheets need further repairs and the external environment is threatening. The Republic is more exposed than any EU member to a slowdown in the US, the strongest export market and the principal source of inward investment. All the evidence suggests that the European economy has already slowed and there is a risk of weak export demand on all fronts. Add in the loss of grip in budgetary management and the threats, from the EU and the US, to the corporate tax regime, and it is easy to paint a gloomy picture. If Mrs May fails to secure a majority for her deal before next Thursday’s European Council, there might be no short extension on offer. Should the EU leaders grant only a 21-month extension and insist on the UK holding elections in May for the European Parliament, the wind is gone from the sails of Brexit and a second referendum, or straight revocation of the Article 50 resignation letter with or without an election, become possibilities. The Irish Government – which will have a veto the same as everyone else since an extension requires unanimity – would have lost its second-best shot at damage-limitation, the defeated withdrawal agreement. It should then switch to supporting only a long extension, in the expectation that this improves the chances of the best possible outcome for Ireland, North and south, which is the abandonment of Brexit. How this comes about is the UK’s business. And it is the good neighbour policy too – Brexit has damaged the UK, the greatest humiliation since Suez. MPs were openly suggesting various ways in which Theresa May could resign — then the breakthrough arrived. Mrs May hot-footed it to Strasbourg to meet Jean-Claude Juncker, and a deal was announced a little after 10pm. Westminster awoke last Tuesday with one question in mind. Had the previous night’s drama changed anything and would Attorney General Geoffrey Cox be able to change his legal advice and say the backstop no longer represented a trap? At 11am, the cat was out of the bag. In a devastating final paragraph to his advice, Mr Cox admitted “the legal risk remains unchanged” that Britain might find itself stuck indefinitely in the backstop. With her voice barely functioning, Mrs May tried one last time to win over the doubters but wasn’t even close as she lost by 149 votes. MPs were given a free vote on no deal, but weren’t happy with the “unclear” motion, which only ruled out no deal this month. Amendments flew, but it was a defeat nonetheless, by 312 to 308. The motion, which now ruled out no deal, was too strong for Mrs May and a free vote was suddenly made a three-line whip. Four Cabinet ministers abstained and a 43-vote defeat left Mrs May’s authority completely shot. The Prime Minister is said to have gone “bats**t” at her rebellious ministers. In defiance of the government line, Philip Hammond called for cross-party consensus and hinted at the need for “indicative” votes on a way forward. On one last day of confusion, Mrs May escaped backbench plans to take control of Brexit by just two votes.